Palm Springs, California and Canandaigua, New York could not be more different. But what you’ll find in both places are beautiful vacation homes, lovingly and thoughtfully furnished with a designer’s tasteful touch. The Mid-Century Modern Alexander at Twin Palms is a three bedroom, two bath vacation home in Palm Springs, California that is a meticulous replica of the famous Krisel Palmer Alexander. Live in luxury with lush furnishings and a private saltwater pool and spa. 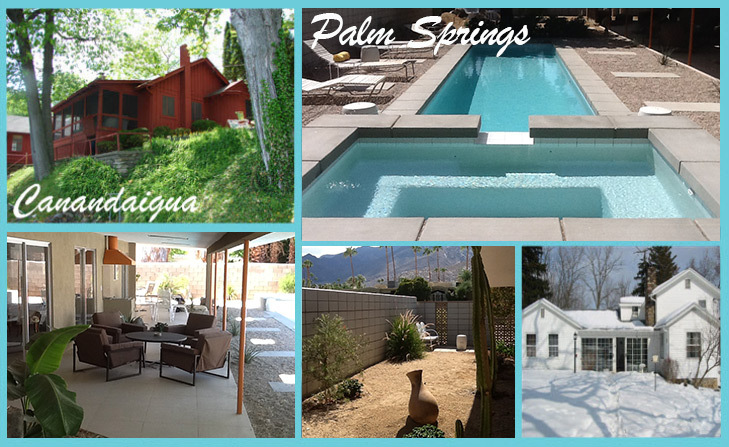 The Ocotillo Lodge Garden Apartment is also located in Palm Springs, California, and is a one bedroom, one bath garden apartment with private patio and access to a shared pool. Should a more temperate climate be attractive to you, West Lake Estate in The Fingerlakes of New York state is situated just across the street from Canandaigua Lake. This beautiful vacation home offers six bedrooms and three-and-half baths, a tennis court and acres of land, perfect for a large family gathering. Also in Canandaigua, New York, is West Lake Cottages. Three charming cottages house three bedrooms and three baths, with a great room, three porches, and a large deck and boathouse. Each home – whether in California or New York – is distinctive, and a perfect place to enjoy a relaxing, inspired vacation. Copyright ©2019 thehouseofmink.com All rights reserved. Website development and promotion by wisnet.com, LLC.